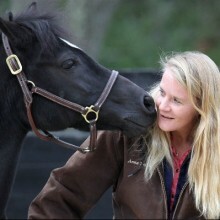 Creating a trust-based relationship is the foundation to all interaction and training with your horse. Not only will you achieve better results in the show-ring, you will also begin to become one with your horse. Together you will achieve optimum performance while learning about one another and growing as individuals. Communication with our horses begins upon approach. We communicate non-verbally through our body language, our energy and simply our being. It is a known fact that about 90% of communication is non-verbal and only 7% is spoken. Horses can read us better than we can read ourselves! Upon your approach they will know how you feel in any given moment, who you are, how you carry yourself and also your intention. It is important therefore, that you are aware of the movements you make and the thoughts you have. Any excess baggage should be left outside the paddock, stall or arena, as it is rather unfair to your four-legged friend to take the rap of your day. Displacement occurs readily through frustration which is caused by a lack of understanding and creativity and can easily rear its head at the end of a hard days work. Knowing and understanding your horse and his communication system will allow for a trust based partnership to build. Wild horses communicate in a language called Equus, which is nonverbal and much like signing for the deaf. Each motion, such as a flick of the ear and a swish of the tail means something. It is a language that we are able to interpret and customize through our own body language. Spending time with your horse and observing others in their natural habitat will allow you to experience the language first hand. Try to be present as you notice the movements of the horse and subsequent responses. Every horse has his own personality, character and role within the herd group and as you familiarize yourself with the group these will become more apparent to you. Behavior will be emphasized during feeding and rankings are more easily identifiable during this time as well. Knowing these aspects of your horse will allow you to understand the way they think and why they respond to certain situations as they do. Although for the most part the language of Equus is non-verbal for preservation purposes, on occasions horses will also become vocal. Domestic horses feel comfortable in their environment to whinny, nicker, snort, squeal and even snore. Each horse will have their own way of expressing their likes and dislikes, fears and concerns as well as their happiness and excitement. Knowing your horse’s natural day to day behavior will allow you to recognize unusual and abnormal behavior. A less spoken about form of communication is your intuition, also known as your sixth sense, or as many famous horsemen have coined it “the feel”. This is a form of inter-species communication. We have all experienced times when we are particularly connected to a brother, sister or close friend and they have been on our minds for a while. When you finally pick up the phone to call them, both of you mention that you’ve been thinking of one another – this, believe it or not, is a basic form of telepathy. Your intuition plays a huge part in your relationship with your horse. You may be touched by a feeling or emotion, which you know is not your own. You may receive a glance of a vision, hear words, or have a vivid dream. Because it is very personal to everyone, its hard to describe and teach intuition to others. As you are able to confirm your intuitive hits, you will learn to trust your intuition and this form of communication will become second nature to you. There are so many facets to encompass when you speak about communication, but I would like to end by saying that horses are social animals. They love to interact, play in groups, take part in mutual grooming etc.. Find out what your horse likes, what motivates them and be a part of their daily lives without an agenda. Instead of thinking what can my horse do for me today, think what it is you can do for your horse!